One thing that came up a couple of times was the fact that the market has been making Kristia quite miserable for the four years that she’s been investing. With practically no growth, it’s made her feel like all she’s doing is putting her own money into the market and getting no extra benefit in return. Now the first thing is that Kristia is wrong, the market hasn’t gone nowhere for the last four years, if you look at the chart below of the JSE in dollar terms over the past four years, you’ll see it’s actually gone down by nearly 18% as the green line below shows. This is where I should remind you that the JSE isn’t the market, it’s a market, just the local market. A minute tiny miniscule piece of the global market, only 0.7% of it. When you invest in the just the South African Market, what you’re actually saying is “I’m better than all the fund managers and economists all over the world. They think they know how to invest, but I’m going to show them, out of the hundreds of stock exchanges and thousands of companies in the world I’m going to put everything into the best 1%. I’ll have so much winning all the winning will make me sick of winning”. If that’s what you do, I hope you make really good money out of all the victims that invest in your unit trust! It’s not only a very limiting investment decision, it’s also very risky keeping all your eggs in one basket, especially when up until February that basket was run by a basket case. And that brings us to another question someone raised in the podcast which “What actually is the market?”. The market is the combination of all the worlds stock exchanges in proportion to their sizes. Your goal as an investor should be to own as much of that as possible, at the lowest cost possible. Now if you had a lot of time on your hands you could try get a brokerage account in all the different countries in the world, and then spend thousands of hours a day trying to calculate what percentage of each you should hold only to realise that you’ve ended up broke because of all the trading fees. Fortunately I’m far too lazy for that, I only want to own one ETF, so I do, the most diversified one (the biggest basket if you like) you can buy if you’re an alien (the US calls people who have never lived there non-resident aliens), the Vanguard FTSE all world index, or VWRD. It’s also the brown line in the chart above which is great, because it means that in the last 4 years I haven’t lost 18%, I’ve actually gained 17%. Now while that difference of 35% makes me rather happy, this post isn’t actually about me trying to convince you to diversify more, if you want more on that you can read this post of mine. This post is about is me trying to show that if you’re just starting to invest, the returns aren’t really such a big deal. That’s the way compound interest works, nothing happens, nothing happens, nothing happens then bam, you’re filthy rich. Now if Kristia was here she’d probably say “f*ck it you see, Warren is the best investor in the world, I need to try get his returns”, but actually if you’re just starting out there’s something far more important, saving more. Let’s imagine we have a young couple, Robert and Katie, who fell in love while studying at varsity. Both happily got jobs straight after graduating as you’d expect, and decided to save so they could retire after just 20 years of working to go travel the world together. Now Robert decided that he would hunt down the best returns. He’d switch between funds, invest in crypto, chase after the best fund managers and try to choose the best companies around. He was a bit of a spender though, so only managed to save R5000 a month. 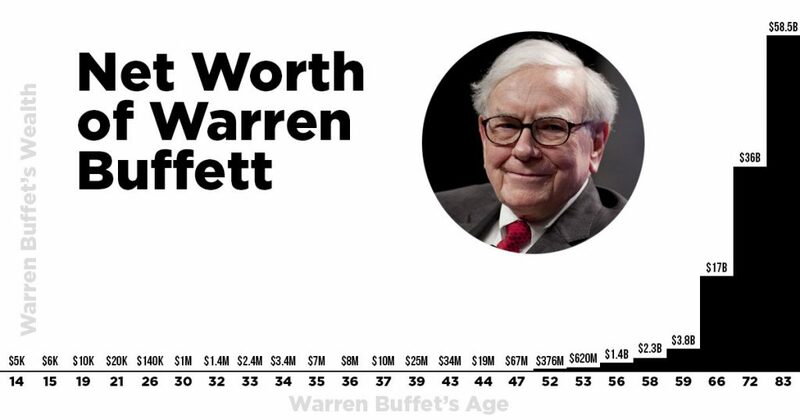 Amazingly he managed to become the next Warren Buffett and earned himself 20% returns for all 20 years. I personally think he was inside trading but I have no proof. Katie was ultra conservative. She wouldn’t even go all into equities. Instead she chose a boring balanced fund that returned 10% a year. To make up for this she pinched her pennies until they squealed and put away R10 000 a month for 20 years. Now who do you think ended up with more money after 20 years? Well if you said Katie, you’d be wrong, of course the increased compounding power of 20% returns would win in the end, but amazingly it would take over 13 years for Robert to catch up with Katie, which goes to show that if you’re just starting out on your investment journey it’s far more important to max out your savings than trying to find every last percent of returns. And to be completely realistic, nobody will ever get 20% a year. Chasing that is more likely to end with a massive amount of fees and extremely risky investments that will give you sleepless nights instead of solid returns. Good investing isn’t supposed to give you frequent heart attacks, it’s not a series of one night stands that may take your breathe away but ultimately make you cry. It’s a long term relationship, stress free with long term happiness. I’m living proof of this. For the first 5 years of my working life I saved money in a bank account and made literally 0% returns. Then I invested in property for another 5 years and probably only matched inflation before finally putting everything into the market to get real returns. The fact that I made no real returns for 10 years was completely outweighed by the fact that I was saving 50% of everything that hit my bank account, and is the reason why I reached a point two years ago where working became optional. If you’re not sure what the right investment strategy is just do whatever you can to save as much as possible. Eventually with time you’ll figure out what to do, and at that point you’ll be glad there’s a small pile of cash to help your magic growing snowball of wealth race away with compounding interest. 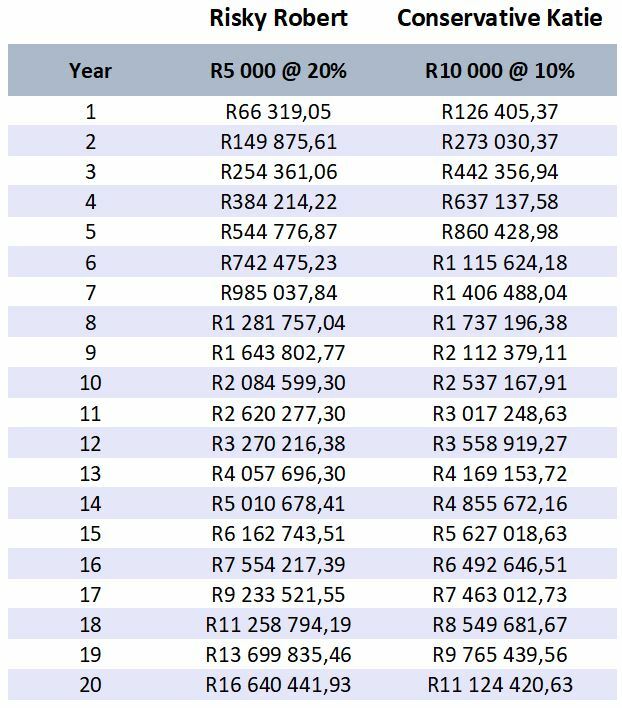 *If you’re curious, R10 000/month at a much more reasonable 15% leaves you with R2 million more than R5 000/month at 20%. Try save more! Are you investing with a one night stand or are you looking for a relationship? **This is not financial advice as I’m not allowed to give it. It’s merely what I do. Please speak to a (fee based) professional before you do anything.